Designed and manufactured to the highest standards in Belgium, the STENTOR™ range is tailor made to withstand the most challenging crowd control and mass notification environments. Ideal as a portable solution for military deployment, police forces, fire brigades and civil defence, the PHD-146 is low profile, water proofed to IP66 standards, robust to military grade, and weighs in at only 13KG (including its Battery and CM1 control microphone). 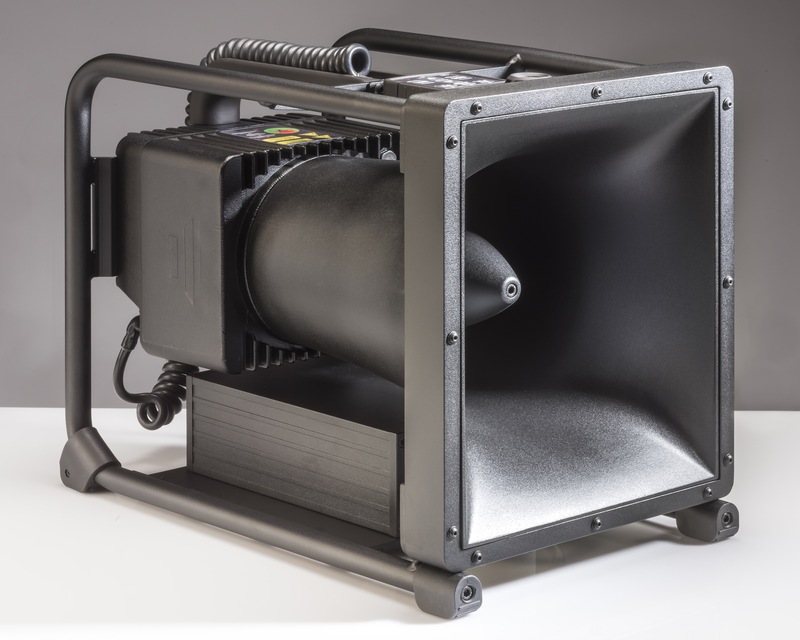 Penetrating high noise environments loudly and clearly for effective high impact crowd or riot control, the PHD-146 communicates loud and clear, providing an impressive 146 dB peak acoustic output. By virtue of its digital signal processing (DSP) platform and its state of the art acoustic design, the PHD-146 stands out by offering an extended audio bandwidth, particularly in the low frequencies/bass output. This ensures that the audio voice projection is natural and warm for better intelligibility and impact. The PHD-146 is equipped with the CM1 control microphone. Featuring an in-built noise-cancelling capsule and feed back suppressor it allows the PHD-146 to broadcast live messages even in the most reverberant environments. Additionally the CM1’s integrated SD card equips the PHD-146 for hours of digital pre-recorded messages or alert tones. Simple to download from a PC or record from the microphone and activate with an easy to select message button. “We’ve combined over 15 years design and manufacturing expertise into developing the STENTOR™ range. Our aim is to fuse current policing demands with modern technology.